We’ve been hearing for months about Facebook’s plans to ramp up its video offerings, and today it’s launched a new service that could help the company steal YouTube and Netflix’s lunch. 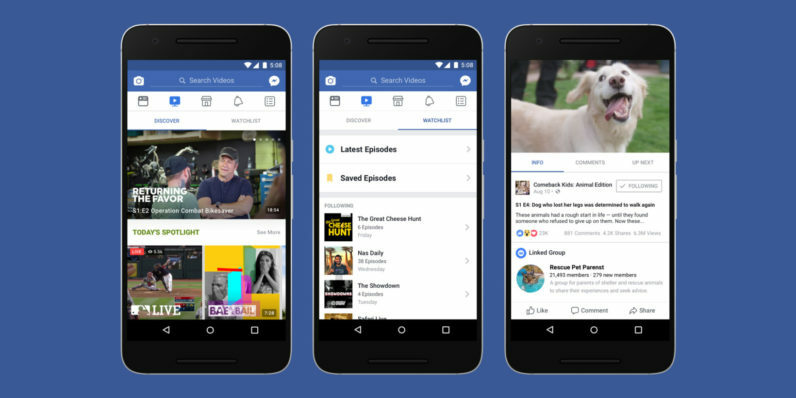 It’s called Watch, and it comes in the form of a video tab in Facebook’s mobile, desktop and TV apps that surfaces channels (called Shows) with live or recorded episodic content that follows a consistent theme. What can you expect to see on Watch? Facebook’s currently opened up the platform to a limited pool of content creators, so you’ll first be able to catch shows like Nas Daily, which features 1-minute clips from around the world each day, motivational speaker Gabby Bernstein’s eponymous series, and Tastemade’s Kitchen Little, which sees kids trying to teach chefs how to cook. Oh, and Major League Baseball will stream a game each week on there too. The service is presently being tested with a handful of users in the US and will gradually roll out nationwide. Facebook is funding some shows and inviting independent creators to sign up to the platform on their own as well; once they’re in, they’ll get a Show Page (similar to Pages for brands) that fans can follow and find clips on. In addition, you’ll also be able to comment and react to videos while you watch, and hear from others as well in real-time – kinda like your experience with Live video. With that, Facebook is gearing up to take on YouTube, which already has programs to support creators and to help them monetize their videos with ads. The social network plans to introduce ad breaks in clips to generate revenue on Watch eventually too, and with a massive user base of two billion people worldwide, it could offer serious competition to Google’s platform. Facebook is ready to go up against heavy hitters like Netflix too – in June, the Wall Street Journal reported that the company was looking to rope in Hollywood producers to create shows for audiences aged 17-30, with multi-million dollar budgets per 30-minute episode. Watch seems like the perfect springboard for that sort of venture. And it doesn’t hurt that, unlike Amazon Prime Video, Facebook’s clips can be streamed to Chromecast and Apple TV, making it more universally accessible to TV viewers. It’ll be interesting to see how Watch pans out over the coming months, and how Facebook adapts its approach when it addresses markets outside the US. If you’re a creator, you can sign up to join the Watch platform by registering on this page. Have you been using Watch? Let us know about your experience and your favorite (or least favorite) shows in the comments.